Our phone discussion opens with mention of Perth’s MoveMe dance festival. Western Australian Academy of Performing Arts (WAAPA) Lecturer Michael Whaites has seen the three principal works, one of them by choreographer Laura Boynes, Dark Matter. He tells me Boynes was a member of LINK Dance, the graduate dance company Whaites runs for Honours level students and whose performances are choreographed by Australian and international artists and toured interstate and overseas. Although now triggering competition, LINK is a unique venture for dance artists looking for joint academic and professional-level experience. What’s the relationship between LINK Dance and the Honours degree? LINK is Honours. The students write a thesis along the journey while I’m throwing choreographers in front of them or taking them interstate or off on overseas trips. So, it’s a huge year. It’s a bit of a horse race, doing Honours. They’ve got to get on the horse and ride as fast as they can. Unlike a Masters or a PhD where they’ve got a bit of time to think, they don’t have much time at all. You’ve got to grab your idea, get ethics approval and then write the damned thing up and get it in. Most Honours are 50-50 in terms of course and theoretical work and how it’s assessed. We used to have a 70-30 balance with more weight on the physical dimension. Now it’s a 60-40 balance and the thesis component is becoming more important. But most of the students need to have 70% grade point averages from their BA years. They have to be smart kids; they can’t just be fabulous dancers and not have a brain on their shoulders. Most of the people coming to LINK, this group-organised Honours course, are wanting to do it because of all the fabulous choreographers and the international tour I organise. Does LINK attract graduates from other universities as well as WAAPA BA graduates? From all over. I’ve been here for 11 years now and I’ve had dancers from VCA, QUT, Adelaide College of the Arts, Deakin University, New Zealand School of Dance, Amsterdam High School for the Arts, Laban Trinity in London…The fact that the course is organised like a professional dance company and the dancers get to tour and to work with a lot of different choreographers, I think that’s the difference. Other Australian universities have started up similar courses in recent years where the students get to work with choreographers on a group work but essentially it’s about training them to be independent artists, nothing like how LINK is organised. But the emergence of these courses has pushed us to think about how we can keep ahead of the game. That’s why, in some ways, we’ve established a Masters course that’s going to run alongside LINK. It’s not a new Masters course. That already exists here at WAAPA as a Performing Arts MA, but we’ve realigned it to fit with LINK. In the first semester of the Masters journey, students have the option of working with LINK as a dancer and to perform in the first season and then to do the international tour with us, which happens in the middle of the year. We’re trying to bring these people with more experience into the program so they’ll have an opportunity to work in a full-time environment with choreographers for the first six months. And they’ll be able to share their experience with Honours students, which will hopefully bring their level up as well. You’ll be drawing these Masters students from all over as well? “From all over. I have four people interested already who have come through the LINK program and have been out in the field for three or four years. Talitha Maslin who’s worked with Lucy Guerin for the last couple of years, she’s now back working with Co3, Perth’s newest dance company. The course is a bit bespoke. It will depend on who applies as to how we precisely engage with them. We’re thinking it will be people who wish to extend their dance careers or who are interested in being makers. They will design a project—whatever they want to do in their second semester and their second year—and then they go about implementing it. The facilities are available here—all the resources they’ll need. If they’re interested in choreography, I’d propose that in their second year in the Masters program they make a work on the Honours group for LINK. Some might want to take on a three-month residency in Toronto or San Francisco or somewhere in Australia, like Bundanon, as part of their program. Absolutely, as long as they can keep on track with their project. Dr Reneé Newman has replaced the late Maggi Phillips as postgraduate supervisor. She’s a theatre maker with an avid interest in dance and is really doing a fabulous job exposing the dancers to new cross-artform and interdisciplinary ways of working. We’re really trying to expand their knowledge in that way as well. Returning to LINK, how often does the company perform? We normally have two seasons, but this year we had one program in May with three choreographers and took it to Mouvements sur la Ville, the off-festival of Montpelier Danse, at the invitation of Didier Theron with whom we’ve had quite a strong relationship. He’s been here working with STRUT Dance (National Choreographic Centre of Western Australia). Didier has been a strong supporter of LINK and that’s the reason we’ve been going to Montpelier each year. He invites people from all over the world and we go there in June-July to present works that we make in the early part of the year. Then in Semester Two we have a new partnership with Co 3 in which LINK get to work with Artistic Director Raewyn Hill and the Co 3 dancers on an extended secondment that lasts through an entire creation and performance process. How exciting is that? Later in the semester this year will be a studio showing and our annual East Coast Tour to both Sydney and Melbourne. Who are some of the artists LINK has worked with recently? 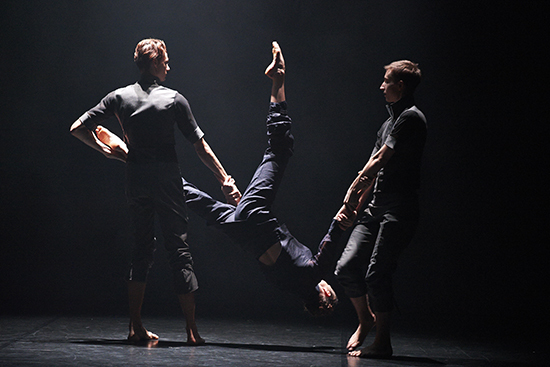 This year we had two choreographers—Lee Brummer and Israel Aloni—who have a company in Sweden called ilDance. They’d been in Australia working with Melbourne’s Yellow Wheel youth dance company, which is housed in Lucy Guerin’s Studio—and then with Adelaide College of the Arts. They did a workshop here at WAAPA and I commissioned them to come back and make a dance-theatre work on the company. The other choreographers were Scott Ewen and Isabella Stone. Scott graduated from WAAPA some years ago and has been working with ADT for the last five years. He left ADT at the beginning of this year and came over and made a work on LINK, his second one. He’s an emerging choreographer whose work has a particular ADT flavor, as you might imagine. Isabella’s also an emerging choreographer here in Perth and an ex-LINK dancer. I like to do that occasionally, to bring people back into the fold. Isabella made her first full-length work last year at the State Theatre Centre. Last year I invited Didier to come out and remount a work called Shanghai Bolero on LINK along with five professional female dancers including Claudia Alessi, Sue Peacock and former LINK dancers. We staged it at Fremantle Arts Centre and it was a huge hit. We took the men’s section to Sydney to perform at the end of last year. It’s clear you keep track of graduates and bring people back into the fold and some of these people will come into the Masters degree. That’s right. We have people all over the world and around Australia. In fact the new Artistic Director of Launceston’s Stompin, Caitlin Comerford, is a graduate of LINK. You’re still enjoying the work after all these years? Yes. Who would have believed it? I came over for three years and, blink, it’s 11 years. I was at the 2016 Dance Awards in Perth the other night and so many of those dancers on the stage, I’ve trained. It’s such a joy and a privilege to see those people. I’ve said, I don’t think it’s my end journey here, but for now, it’s going well. And you continue to train dancers at WAAPA? Yes, I’m working in the undergraduate program as well. I teach composition to first years and improvisation to second years and technique to third years. That’s half my job and the other half is running the LINK program and now this new Masters component. It’s keeping me busy, that’s for sure. Western Australian Academy of Performing Arts (WAAPA), Edith Cowan University, Perth. Read about the one-year Bachelor of Arts (Dance) Honours degree incorporating LINK Dance Company here and the two-year fulltime Master of Arts (Performing Arts) degree here.